A good pair of best gardening shoes will save you a lot of trouble. Let’s say that you hop into your favorite everyday shoes and rush to your garden. A light, early morning drizzle refreshes your face, and you step onto an immaculate dew-covered meadow. You cannot wait to begin with your garden activities, and, suddenly, you step into a deep, muddy puddle. Your morning is, so to say, ruined, just like your favorite pair of shoes. This is why a good pair of gardening shoes will save you from constantly cleaning or changing your usual shoes. But, you have to make a choice. There are innumerable models of gardening shoes, and sometimes, it’s not easy to choose the best one. This is the purpose of this article: to help you find the best one for you. It would be too easy to just choose one that’s the best for everyone and that’s it. No, here, we’re going to lay out the most prominent characteristics of each and every shoe, and let you choose the one that’s most up to your standards. Before we describe thorougly the 10 best shoes, boots and clogs for gardening, it should be pointed out that this category of gardening products is so diverse that by choosing just 10 items we were forced to let out some fairly good pieces, that, however, we found inferior to the ones mentioned here. This is one of the most popular shoes for gardening- in other words, reviews aren’t scarce, and boy, they all praise this shoe for a number of reasons. Ease of maintenance, cost, diversity in color, weather-resistance, etc., we could go on and on. Imagine getting out of your garden after a hard day’s work. You practically cannot see your shoes because of mud, earth and what not. And imagine taking your garden hose, giving them a little spraying and BAM! The shoes are clean and shiny again! The special (recyclable!!) material they are made of really spares your time. You won’t have to watch your step when you hop into these shoes. The already mentioned material is resistant to any weather condition- muddy ponds, heavy rains, beware of Sluggers! Tengta Unisex shoes have soles which provide you with a nice grip and eliminates the chances of you slipping and hurting yourself. They are water-resistant, have an easy cleaning exterior, with Airmesh lining. They are made from neoprene and natural rubber and there are several colors from which you can choose the one you like the most. The rubber sole has a lot of indentations which, as said, will give you a firm grip and prevent you from falling down on slippy surfaces. 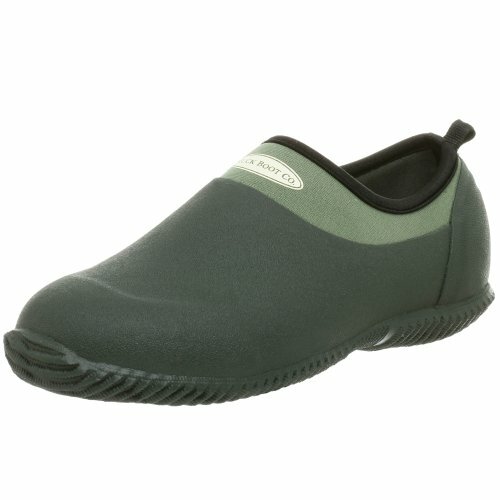 Unlike some gardening shoes, these are suitable for men as well as for women. This means that you don’t have to be afraid of buying them and seeing your neighbors giving you a weird look. Another jewel from Sloggers. These are the best gardening shoes for gardeners who really like to get out in the rain and don’t want to any puddles (or ponds) to get into their way. Really, if you succeed in wetting your legs in these shoes, you deserve a medal. Back to basics- they have heavy-duty lug tread for good traction, made in USA, once again, from recyclable material, NON-latex and vegan-friendly- meaning that no animals are hurt in any way during the making of this product. Insoles for this shoe are removable, and if your old ones are worn out, you can order new ones from Sloggers. Once again, however obstinate you are in getting this garden boot dirty, a sprinkle of water here and there and they are nice and shiny. Like with the aforementioned Sluggers, it may be a problem to find the appropriate size, especially for men. Also, a vast majority of men, if not all, would find these boots quite feminine- however, you can always buy a completely black model. But problems can arise even for women, as these boots are available in whole sizes only. To attain a perfect fit, you will have to search further for the Sloggers Half Sizer insole and spend a little more money. Available only in whole sizes. Another one from the heavyweight category boots. Completely made from natural rubber, apart from lining, they will protect you even from the harshest weather conditions. As was the case with some other shoes and boots, this product also runs small, so it is advisable to order one size up. The unique printed design will make you feel like a real fashion diva whenever you go out to sort those bushes that went amock, or when even when you want to do some harder stuff, like digging holes for your newly acquired petunias. Be aware of envious neighbors! With some other boots, you might get that loose feel, like they’re gonna come off any time. Not with this one. You can get them to fit real tight with a little help of a very smart strap mechanism- you will just have to fasten your (boot) belt and take off… to your garden. These shoes are somewhat different when compared to most of the models that comprise this list. For example, they have ventilation ports, meant to provide you with maximum breathability and to allow water to exit your garden shoes. The ventilation holes aren’t placed randomly- they are strategically placed so that the parts that sweat the most have a lot of “breathing space”. Its synthetic sole will protect you from all kinds of elements and give you the much-needed grip. Probably the best thing about Amoji Unisex is that they are extremely lightweight- which is at the same time a trait praised the most from numerous happy customers. A special ergonomic design will suit any men, women, and even children. What’s more, the shoe will accommodate to the shape of your foot thus giving you a highly personalized experience. You will be able to wash them thoroughly in 30 seconds! Also, due to ventilation holes, you will be able to wash the interior as well as exterior parts of the shoe. Of course, there is the downside of all those ventilation ports. It will be almost inevitable to avoid sand, mud, earth, etc, getting into your beloved piece of clothing. But, if you’re not a hygienic policeman, you will easily endure this and wash your Amoji Unisex in no time. And here come the famous Crocs! The popularity of these clogs really speaks for itself, but these are special in several ways. For example, they are specifically meant for women, which is obvious from the lush visual design- some designs are so life-like that you won’t recognize your feet from the rest of the garden! They also have croslite foam cushion that will absorb the most intense forces. These clogs are the best for women with slim and sleek profile. If you’re not that into floral patterns, do not despair, as there are some interesting leopard patterns, or other, arabesque-styled patterns. 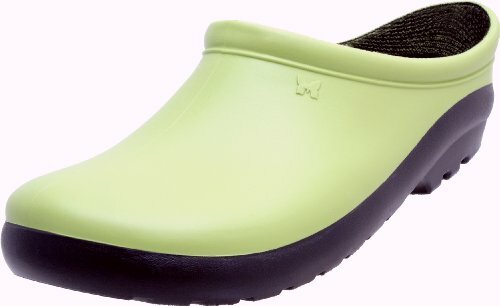 “So darn comfortable!”, “Extremely comfortable, this is one of the Crocs’ most comfy models, even if you wear them the whole day!”- are just some of the innumerable reviews that speak enough of these clogs’ impeccable comfortability. The thermal and water insulation on these is excellent. 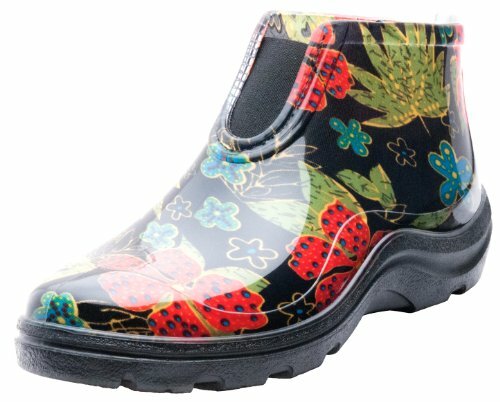 Snow, puddles, or gentle morning dew, it doesn’t matter to Joinfree Women’s Rain Boots. Furthermore, a good rubber sole will keep the bottom of your feet nice and warm, even in the harshest weather. The soles are specifically designed to achieve maximum grip, even in the worst circumstances. This is achieved with intermittently positing stripes and natural rubber. They are so good that you won’t have to change your boots even if you decide to take a break from the usual gardening activities and go climbing on some serious rocks and cliffs! Of course, they will be your reliable companion during the long walks and hikes. To make a long story short- you can stretch these soles endlessly- they won’t crack even under extreme pressure. Its cuff lightly padded- it is made from waterproof nylon. Because of the nylon, these boots are much easier to wear and very comfy for walking. Your arches and ankles will have additional support with a special user-friendly design. You will also have no problems with getting them on or off- just a second and your feet will slip in and out from them seamlessly. The Charles Alber slip-on clogs are available in solid colors, as well as in interesting patterns. The fleece textile lining will provide your feet with much-needed air, and hopefully prevent some unwanted aromas. They are also vegan-friendly, and 100% made from recyclable, environment-friendly materials. As was the case with some other articles mentioned on this list, with these shoes also you won’t have many problems when they get dirty. A quick splash here and there and they’re going to be shiny like new. Although these shoes may look sturdy and able to fare well with harsh elements like mud and wet grass, some reviewers state the opposite. What’s more, cleaning them might turn to a nightmare if something like thick mud found its way into them- “ It was more like a magnet for it”- stated one (unhappy) customer. However, this is only the case when something gets into the inside of shoes. If you keep all those nasty things out, you shouldn’t have a problem with cleaning them. 100% synthetic- some customers would perhaps be deterred by this fact. How wrong they are! These are unbelievably lightweight, waterproof garden shoes. The soles are designed in such a way that they clean themselves! No need to tap your feet endlessly expecting all those little particles of dirt to come off. With the slick look of these shoes, you won’t have to be afraid of sporting them around the block- you won’t even have to change them after you’re finished with your usual gardening activities. They will even keep you warm and dry during the cold months of the year. The good bits don’t end here- they are unisex, so you won’t have to ponder the endless kinds of patterns and designs in order to avoid looking weird, as is the case with most of the gardening shoes. Running, exercising, playing with your dog in the park, or a hard day’s work in the garden, you’ll be able to do all these activities without changing your shoes even once! Compared to other gardening shoes, someone could judge Muck Boot as too expensive. But innumerable happy customers and their euphoric reviews only justify your decision to buy this product. Versatile- a good candidate for your main shoes! This pair of Wellingtons boots is, in a way, a fusion of opposites. At the same time, they are extremely lightweight but made from the first-quality PVC. They flex and bend in any way- giving you additional comfortability. You can also “compress” them and pack these Wellingtons in a quite small bag- ideal for trips! If their height isn’t enough, you can adjust their width using a collar thereby eliminating any possibility of water getting inside. Even if you find a size that fits you, you may have some problems with width- the company that makes these boots clearly states that they are not the perfect product for people with wider calves. They are sturdy, durable and comfortable… once you get them on! We’ve talked here about another pair of boots that has a little belt to loosen them a bit when you’re taking them off and on. The Wellingtons Wellies, on the other hand, don’t possess such convenience, so getting them on can be a drag ( a real drag) and taking them off even harder, especially if you’re feet are sweaty from a busy day at the garden. This is another consequence of the narrow calve area. We’ve seen the pros and cons of 10 products that made their way to this list. Note that they are probably the best 10 products in this category, so they all are good, and some are even great. Probably the most important thing you could have learned from this text is to take the width of your foot and calf into consideration before spending your money. Always make sure to check the dimensions of the product and perhaps look for some reviews. 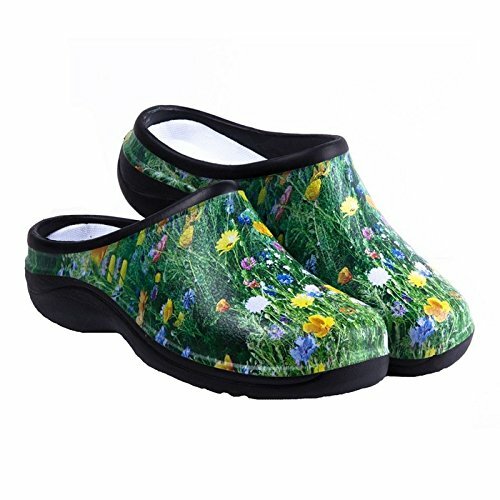 The cheapest product on this list are Amoji Unisex Garden Clogs Shoes Sandals Slippers – they cost only 16$! They have nice ventilation ports and are best for people that don’t tend to get out in the garden during heavy weather. If you would use them only from time to time and not for heavy works, then you should seriously consider buying this product. The best boots on this list is, without a doubt, Muck Boots . We’ve already praised them enough, so we’re only going to enumerate just some of their most prominent qualities- great quality/price ratio (70$), extreme versatility (you can easily wear them outside the garden), elegant and slick looks, etc. What things are important to consider while purchasing garden shoes? – For example, if you’re going to use them on an everyday basis, finding robust, comfortable shoes will be your primary objective. Especially if you’re going to use them outside your garden, they will need to be suitable for long walks without causing those nasty blisters. For these needs, Muck Boots are a very good choice. Yes, they are a bit more expensive than the competition, but, you get what you pay for! 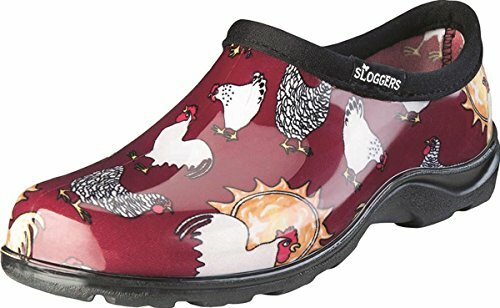 – Sloggers are a special variant of garden shoes. They are particularly popular at the moment, partly because you can choose one from innumerable colorful patterns. If this is an important aspect of best gardening shoes for you, then search no more, Sloggers are for you! I have a wide instep will SheSole Boot work for me? – Probably not. Several customers say that they are very narrow, so be careful to take this into consideration before buying them. How often will I have to replace my gardening shoes? – Depends on your choice. If you opt for the Muck Boots, chances are that you won’t have to worry about buying new ones for quite some time. On the other hand, if you choose Crocs, for example, or any other shoes or clogs that have “ventilation” holes, it may happen so that some branches tear them apart. On the other hand, Crocs are very modestly priced, so you will always be able to buy new ones and don’t feel your wallet getting any lighter. 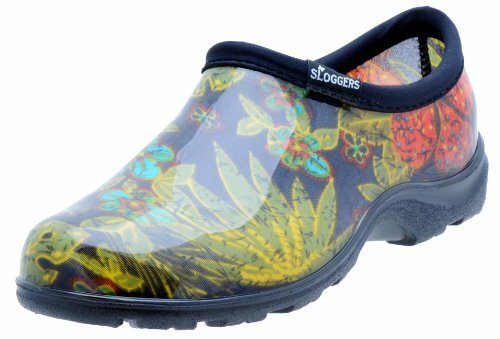 Could I bring Sloggers for walking around the city when it's raining...or should it be for 'slogging around' around the garden and just short errands? – These shoes have heavy duty lug tread which should ensure good traction thus minimizing the risk of a skid.